Satzger and Menzies’ work both focus on portraiture, yet their style could not be more different visually. In Satzger’s series What is Reality? 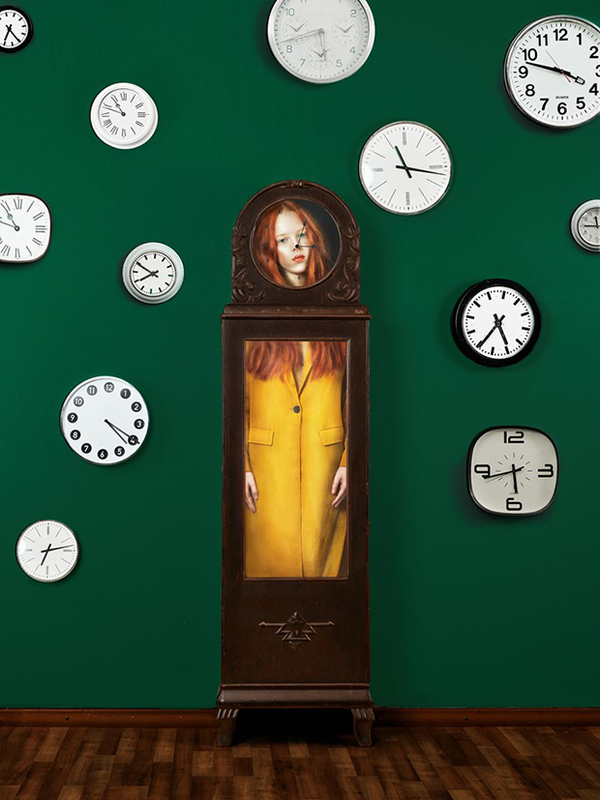 featured in the exhibition, highly saturated colors and crisp lines create hyper-real, yet impossible, scenarios where women appear doll-like, stuck inside objects like clocks, or engulfed in a world composed of nothing but endless pattern. The subjects of her work appear so perfect, with colors so vivid, that they become unreal, because they are more enticing than our actual reality. 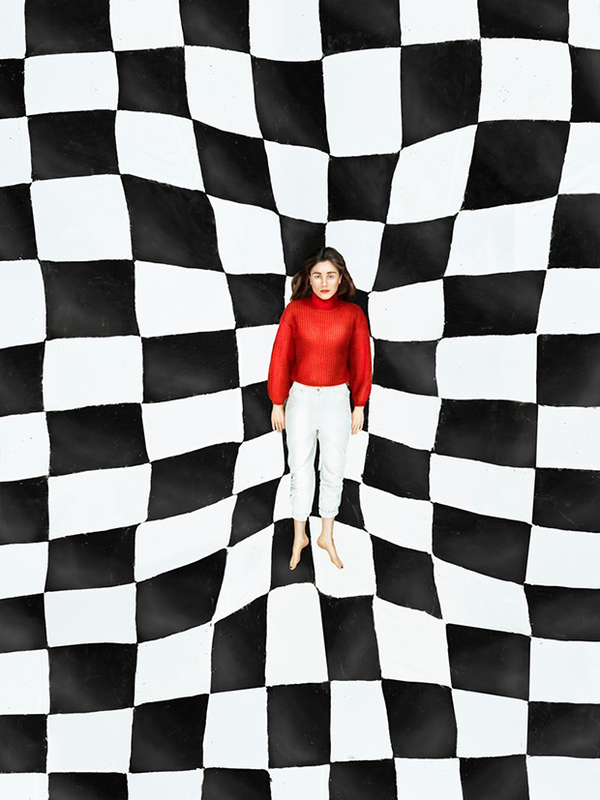 Inspired by literary works and surrealism, Satzger’s work is bold and graphic as she constructs hypnotizing compositions that intentionally warp any sense of reality. Satzger’s work is distinctly set apart from the soft tones of grey and the subtle, haunting elements found in the work of Lauren Menzies. 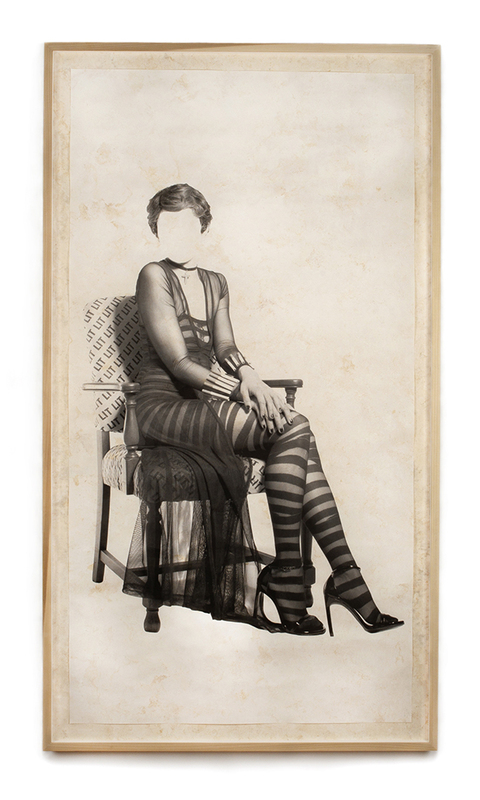 In Menzies’ series Femme Fictions, self-portrait photographs of the artist adorn handmade paper, giving the work an appearance not unlike a drawing. In a culture where one is always posting photos of oneself for all to see—a society where we yearn to capture and share our own face—Menzies decisively excludes this identifier. 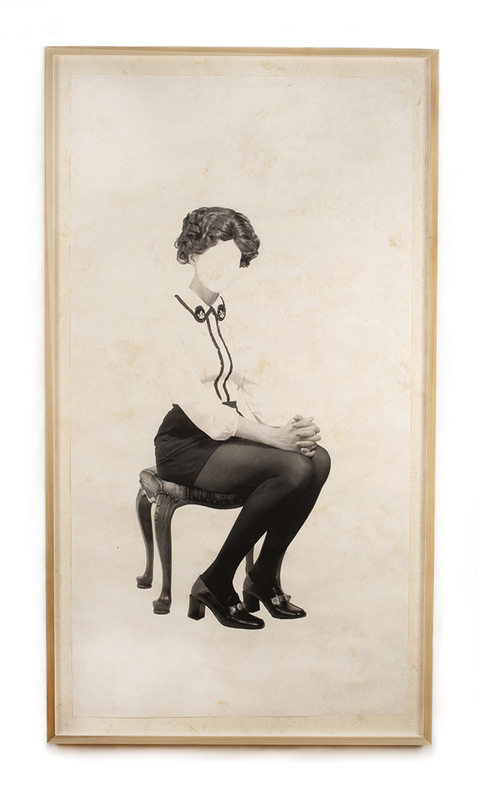 In her self-portraits, her face is left blank. However, within the absence of something, anything can be imagined. 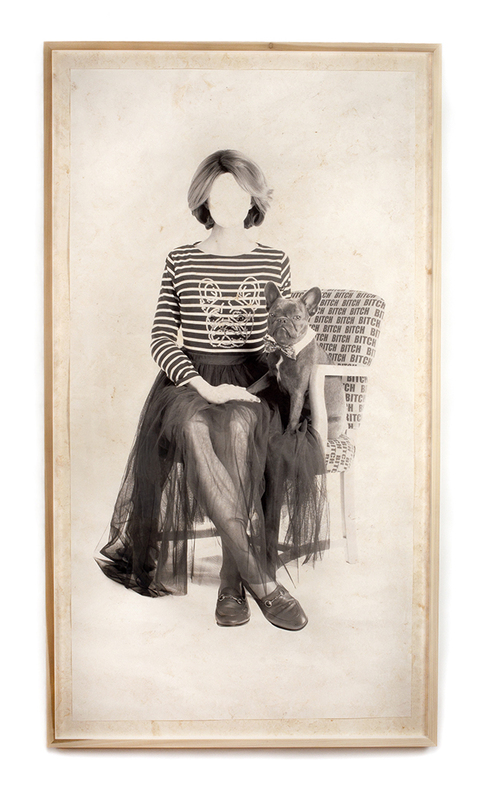 Does the blank face act as a mirror for the viewer, projecting ourselves onto the subject? Is the blank face a loss of identity, or is it a blank slate, a fresh start and freedom to be whoever you want, without judgment? Both ghostly and eerily beautiful, these portraits, like Satzger’s subjects, cannot exist. While Satzger’s subjects are doll-like and almost too real, Menzies’ subjects are disappearing, their realness dissipating. Each of Menzies’ portraits is an empty shell that can be anyone or no one, each one capturing the essence of a character or female archetype. The two bodies of work are not just tied together through portraiture, but also through the surreal and dreamlike aesthetics interwoven through the photographs, creating a breadcrumb trail to something within the realm of science fiction. 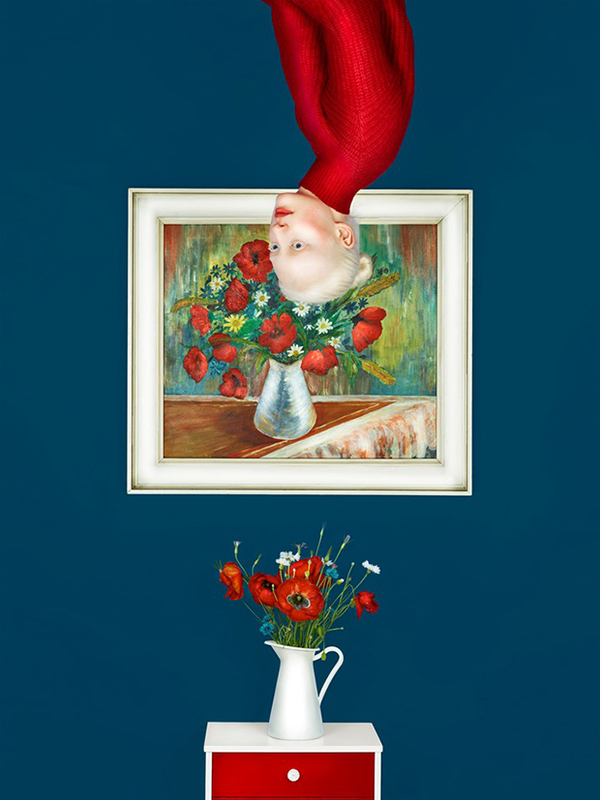 Both works carry a surreal quality that is part portrait, part Twilight Zone, and part investigation into the fabrication of reality and lack thereof in perception. See the exhibition at UPI now through May 31.